Andean textiles have the longest historical record in the world, with scholarly estimates dating them back to 3000 B.C. This shigra is particularly valuable, both because of its size and because of the pictoral as well as geometric aspects of its design. One marvelous example, still being woven today in the highlands of Ecuador is the shigra. 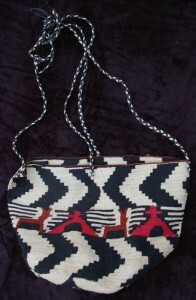 Traditionally utilitarian, shigras were carried to market as produce bags or in the high Andean fields as seed bags for planting. It has been theorized that shigras were originally woven in standard sizes and used for measuring and carrying seed units. While still in agricultural use in remote areas, shigras have recently taken their place in the world market as a fashion accessory.This shigra is particularly valuable, both because of its size and because of the pictoral as well as geometric aspects of its design. o fine strands and dyed. Originally, vegetal dyes were used, but as they are not colorfast, aniline dyes have largely replaced them. The colored fibers are then wound onto spindles and from there, the weaving begins. given way to a trend of geometric shapes. The finished bag will have two long, braided, cross-body fiber straps. That’s how mine looked, the day it was given to me. A beautiful shigra with bold geometric patterns, animals, trees, numbers, and letters in pink, red,orange, brown and black and two long fiber straps. Two days later, however, it had been altered by my dog, who decided to add a little fiber to her diet, I guess. She had a mouthful and my straps were a tattered mess. I said, “Oh no, no, no, you naughty Little Darling,” or maybe something a tiny bit stronger, and saved what I could. I retied the ends and that worked well enough for a while, but admittedly, they were a little short. Eventually I replaced them entirely with leather. This was at no small expense, but in all honesty, I think it was worth the price. The new handles nicely preserve the integrity of my shigra and I happily carry a fantastically functional and fashionable Andean textile everywhere I go. 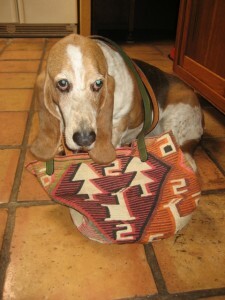 My basset hound too, is pleased with my shigra’s stylish utility and she is very glad she didn’t eat the whole thing after all.